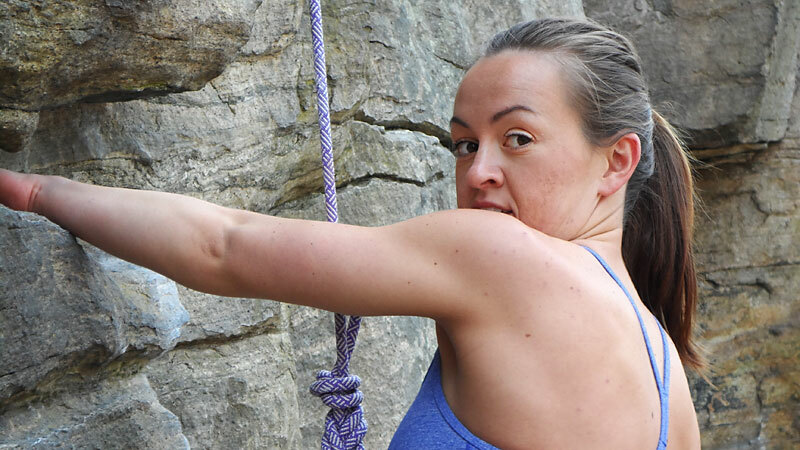 Auto racer Ashley Freiberg shows off her rock climbing skills. We won't leave you hanging! Here are six quick reasons you might want to give rock climbing a shot this summer and beyond. "Women learn to climb faster. Climbing is all about balance and grace, and you're using your legs and feet first. Men tend to want to use their upper-body strength to pull themselves up; women are willing to trust their legs to walk up the rock." -- Bill Fallon, rock-climbing guide with 360 Adventures in Phoenix, Ariz.
"Stand-up paddleboarding uses your core strength, especially the abs and obliques. I love rock climbing because it engages all your muscles and is an amazing form of core strength cross training for my races." "As a professional golfer, most days revolve around improving my game, traveling and competing. ... Rock climbing allows me to relax and forget about all that. It's physically demanding and has some danger, so it requires you to be one with what you are doing right in that moment; nothing else can creep in your mind because you're just so focused on holding on to the grips and figuring out your next move. When rock climbing outside, you are always in the middle of nowhere with great scenery." "I'm the type of person who needs to feel productive, like I'm working toward something and making progress. With climbing, there's always another goal, whether it's a boulder problem, route, or big mountain objective. ... It's not only physically difficult, but it's a mental game, too; you must constantly battle fear, be a good problem solver, and be able to push yourself past physical limits." "I love climbing because it's one of the few times in life that I'm forced to truly focus on the present moment. When you're leading a challenging climb, there's no room for anything else, just you and the rock and the task at hand. It's awesomely meditative and exhilarating at the same time." "Climbing is my happy place. It's where I can escape from the daily chaos of life. Climbing has also helped through some major struggles in my life by showing me how strong I really am. I hope my children can take that away from climbing as well, see how strong they are and that they can do whatever they put their minds to."